Amphora is a Dutch brand of pipe tobacco which is famous for its rich aromatic flavor. For its rich aroma it uses Cavendish-processed blend which combines Virginia, Burley and several spicy tobaccos all pressed together and steamed. This mix makes a very tasteful smoke with a mild to medium strength. Amphora is offered for attractive prices so if you are looking for the best value for your money – you should try it today! Shopping online for pipe tobacco has never been easier! Duty Free Depot offers a wide variety of premium yet cheap pipe tobacco like Amphora at the lowest prices available with just a few clicks to be delivered at your doorstep. That's right! Duty Free Depot policy was and always will be Worldwide Shipping. No matter where you live and how much you order you will get your products. 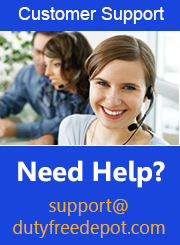 For any inquiry, problem or question we provide an experienced support team to guide you through every step of the way. Browse our extensive catalog of tobacco and cigars and take a look at our special deals to save even more.